In case you did not know it, the swimming pool we had last year decided to retire itself at the end of last summer. We had our own little tsunami in the back yard. 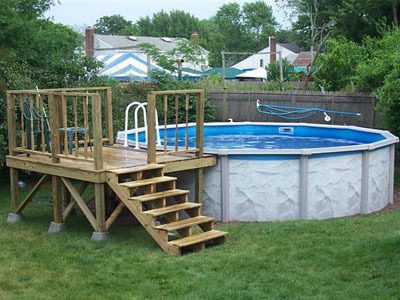 We recently got our new (and taller) pool up then found out the ladder we had to get in and out was too short for it. We had to decide… should we buy a new ladder or build a deck? After sketching up some plans and comparing cost, we decided it would not be much more to build a deck. Also with 3 teenagers and their many friends coming over, a deck would last much longer. Here are the results of our work over the last 2 weekends….